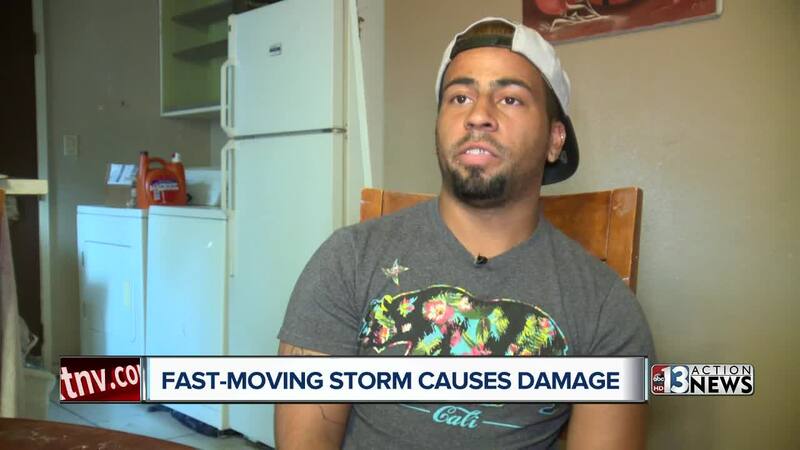 A fast-moving storm that seemed like relief from triple-digit temperatures in the Las Vegas valley caused major headaches for families in one neighborhood. Robert Evans was hard at work cutting up his neighbor's fallen tree as the sun beat down after a quick 15-minute shower. He said the 30-plus-foot tree that had one root "about the size of my thigh" and wasn't the only tree down in the area. "On this street, there were one, two, three, four about five trees," Evans said. City of Las Vegas crews were out surveying the damage and working to get several of the fallen trees out of the roads. Several of the trees crushed cars, took down power lines and destroyed roof tiles. Kyle Romesburg said he's come to expect the damage because Tuesday's storm was the third to tear a branch off the tree in front of the home he rents. The first smashing his car's windshield and the latest landing on the roof.